Looking for a special gift for the Delta Chi brothers and fans in your life? Look no further than our 2017 alumni chapter commemorative coins, now on sale. 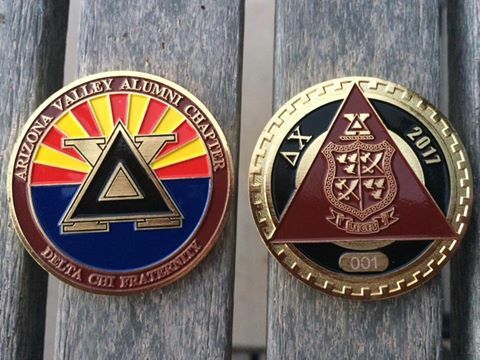 The coins, designed by New Mexico State Delta Chi William Kennedy, are only $15 (plus $3 shipping if you are unable to pick it up in the Phoenix area), and proceeds will benefit the V Foundation and the Delta Chi Educational Foundation. The coins are customized with the Arizona flag behind Delta Chi letters. Each coin is individually numbered, and supplies are limited. We are looking to make this a regular fundraiser, so don’t miss your chance to get the first coin in the set. If you’d like to order a coin, please use the button below to pay by debit or credit card. If you’d prefer to pay with cash, please email azvalleyalumni@gmail.com. Update: Coins are now sold out. Thank you to those who purchased.